Some of the most common complaints we hear about modern bikes concern the retail sticker shock and the expense of maintenance. And on top of this cacophony of complaints from the general whiners and moaners, there is an additional group of complainers lamenting the absence of true off-road bikes for smaller riders. AJP is a new-to-the-U.S. company that was founded in 1987 in Portugal by AJP himself: seven-time Portuguese National Enduro champion Antonio J. Pinto. In the early years, AJP focused on uber-competitive two-strokes, but even a quick look at the PR4 reveals that the air-cooled, electric-start motor is no enduro championship weapon. 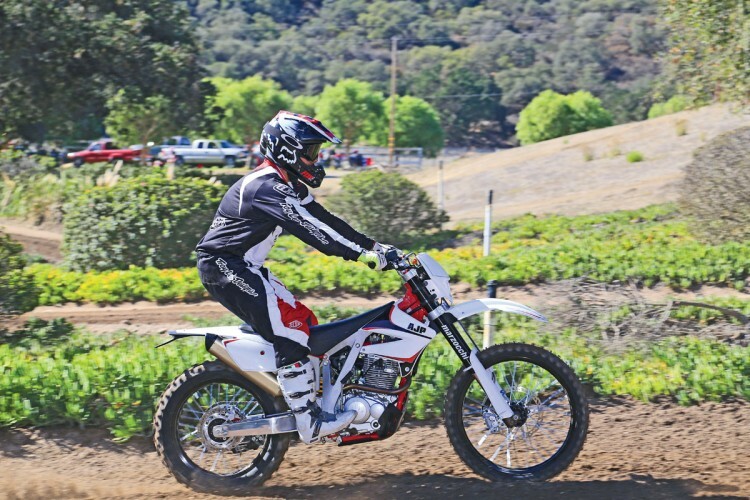 Even though the engine has more in common with a Honda CRF230F than a race-spec 250cc, the chassis and running gear have serious off-road credibility. In designing the PR4 (and the more compact, lower-seat-height PR3 that shares the same look and engine combo), AJP insisted on a short wheelbase, the fuel tank under the seat, a narrow standover width and high-end suspension. The hybrid aluminum and steel frame is strong, lightweight and easy to manufacture, and it easily accepts changes like those that created the downsized PR3 240. As compact as the riding position is, a lowering link comes with the bike, and that would drop the seat height another inch. 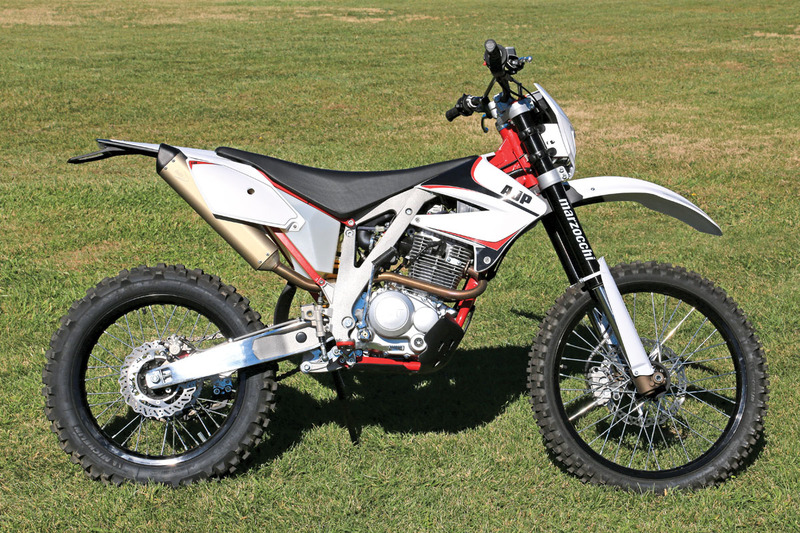 Using the modular chassis and the Zongshen 233cc air-cooled motor allows AJP to build a serious dirt cycle that sells for $4995. 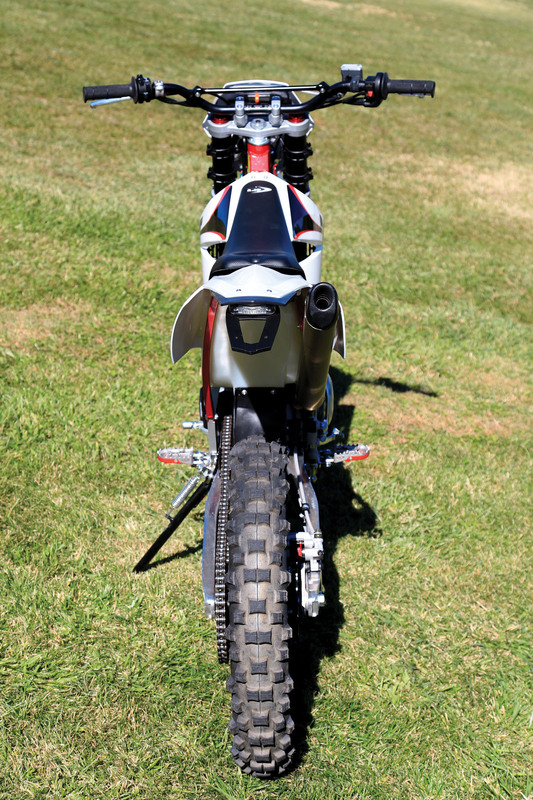 That may sound like a decently sized price tag, but consider that the Honda CRF230F carries a similar engine, and it cannot approach the suspension performance of the PR4. There is definitely more handling and suspension here than motor, but it is a blast to ride if the going is tight and technical. Stay away from tracks, desert sand whoops and giant climbs, though. Never heard of Zongshen? It is a Chinese engine company that is ISO 9001 certified. Companies must be audited to demonstrate their compliance to the ISO 9001:2008 guidelines developed by the International Organization for Standardization. These standards speak well for the quality of the motor, and our testing proved that the engine starts reliably and runs smoothly and quietly and that the clutch and shifting are very good. The AJP is street-legal in Europe, and it is a shame that it isn’t in the U.S. The importer has customers with 4000 miles on PR4s, and they claim that in Europe some customers have 40,000 miles on them. Like other motors originally intended for dual-sport bikes, the transmission has some big jumps. First is much lower than second, and we would like even lower gearing to make second more responsive and to close up the gaps a little. There is enough power to have plenty of fun. We could have had more fun if the bike had a spark arrestor, but there isn’t one available yet, so we were limited to private property. AJP is working on a vendor to provide a spark-legal muffler. We are ready, because there are trails we have in mind for this bike. If you were to start with an air-cooled play bike like the CRF230F or the Yamaha TT-R230, you would have to spend thousands to get the controls, footpegs and suspension that the AJP has stock. If you are looking for a solid off-road bike with no radiators to crush, the AJP is a serious, high-performance option.